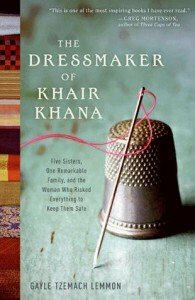 I was visiting the West Hollywood store a month ago and had the pleasure of meeting Gayle Tzemach Lemmon, author of The Dressmaker of Khair Khana. Gayle is a journalist who has written a very insightful book about women in Afghanistan and how they have survived war and the Taliban using only a needle and thread and their own ingenuity. Of course, I was attracted to the title. My grandmother was a dressmaker. But I am always interested in stories about brave women; especially women who become overnight entrepreneurs out of need to keep their families alive and well. War stories have become the norm but rarely do they remember women. Stories of these women who are left behind must be told. They are the women that hold families and communities together until the men return. This story is one. The courage, creativity and sheer energy of Kamela Sidiqi and her sisters is awe inspiring. I hope to meet her one day. I have asked Gayle what I can do to help. Her answer is that the story needs to be told. We will be giving away her books next week in our showrooms. Of course, you can always buy on line or at your local store. You will be glad you did. It will help you to understand Afghanistan in a very personal way.